Illustration of Field Manual FM 10-63 describing “Graves Registration”, published by the War Department, dated 15 January 1945. The care of deceased military personnel and the maintenance and supervision of National Cemeteries were among some of the special services entrusted to The Quartermaster General. In 1861 the Secretary of War ordered The Quartermaster General to provide forms for preserving burial records and materials for registered headboards to be placed at the heads of all fallen soldiers’ graves. In 1876 the Secretary of War formally charged The Quartermaster General with the responsibility of supervising the National Cemetery system, and centralizing all Mortuary Records. The way was further paved for a Theater Graves Registration Service during WW1, when The Quartermaster General became responsible for the care of the dead and charged with the preservation of Mortuary Records as well as the maintenance of temporary Burials and semi-permanent Military Cemeteries. During World War 1 a number of Graves Registration units operating in the advance section and in the combat zone were grouped under the Army Quartermaster and assigned to areas, Divisions, or Corps. They usually consisted of 2 Officers assisted by 50 Enlisted Men, who supervised burials, collected and disposed of personal effects, and procured and maintained military cemeteries. 3 June 1944 Chart detailing the Graves Registration & Effects Division, as part of the overall E.T.O. Chief Quartermaster’s organization. The outbreak of WW2, brought about a complete reorganization of the War Department. Fighting forces in 1942 and early 1943 were obliged to improvise their own Graves Registration Service, and tactical units were responsible for collecting and burying their own dead. Between 28 March 1943 and 2 December 1943 – thirteen GRS Companies were initially activated (later increased to 19 Companies –ed). Tactics and doctrine, as well as training were not yet available; the first document to be used as a basis was T/O 10-297, dated 1 January 1940, with other publications such as FM 10-5, dated March 10, 1941 “Quartermaster Operations”, subsequently followed by FM 10-10, dated March 2, 1942 “Quartermaster Services in Theater of Operations”, and another tool such as TM 10-630, dated 23 September 1941 “Graves Registration”. The first United States Graves Registration Agency was established on 21 April 1942, followed by setup of an Effects Quartermaster Division (with centralized QM Depot in Kansas City) 28 July 1942. 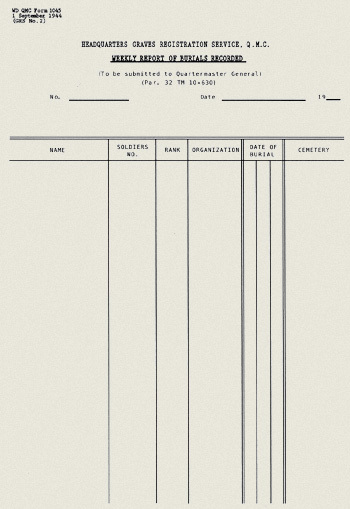 There was a strong need for simplification and reorganization, and finally The Quartermaster General was designated Chief, American Graves Registration Service by War Department Circular 206, dated 11 September 1943, making him responsible for formulating policies for the operation of Graves Registration Services outside the continental United States. Based on field experience and subsequent recommendations and instructions, amended versions of T/O 10-297 would follow in 1943 and 1944. Official ETOUSA reports indicated the effective personnel strength of GR Companies (based on T/O 10-297) to reach 10 Companies, with an aggregate strength of 1,350 men on 8 February 1943; 10 Companies with a total strength of 1,350 men on 12 March 1943; 7 Companies with an overall strength of 910 men on 28 November 1943; and 21 Companies with an aggregate strength of 2,645 men on 1 September 1944. Partial views of “Henri-Chapelle United States Military Cemetery”, Belgium. Picture taken in August of 1947, at that time Greek Crosses and Stars of David were still made of white-painted wood. Four (4) QM GR Companies were included in the 1942 War Department Augmentation Mobilization Plan. As matters eventuated, instead of the four originally contemplated, 13 Quartermaster Graves Registration Companies were activated between 28 March 1942 and 2 December 1942. However, not until early 1943, did facilities become available to provide a comprehensive course of unit training under the provisions of Mobilization Training Program (MTP) 10-3, issued in 1943, for the 5 QM GR Cies activated between 25 April 1943 and 15 August 1943. FM 10-5, dated 10 March 1941 > Graves Registration and Mortuary matters are functions of the Division Quartermaster. The Graves Registration Section of the Division Quartermaster’s Office is responsible for recommending the location of cemeteries and the registration of graves therein. Locations for cemeteries are approved and designated by Division and higher echelons. The Section is responsible for proper sketches showing permanent landmarks and compilation of data necessary to locate the cemeteries. It is also responsible for identification and proper burial of the dead and for keeping the number of single graves to a minimum. The inspection, collection, and disposition of personal effects of the dead are performed by this Section. Documents found on enemy bodies will be examined by the Intelligence Officer before disposition. The Section is also responsible for general supervision of all attached Graves Registration units. The primary function of the Graves Registration units is to perform clerical and supervisory work. The labor in connection with burial is performed either by labor troops from the Quartermaster Service Companies, civilian, or Prisoner-of-War labor. In combat, a small Detachment of the Graves Registration unit is located at each of the Collecting Stations and at the Division Hospitals; at points where the greatest number of dead are to be found. The remainder of the Detachment makes a systematic search through the battlefield with particular attention to the unit First-Aid Stations. The transportation necessary for burial is furnished by the Motor units of the Quartermaster Corps. Cemeteries are located, if possible, near the expected bulk of casualties. Cemeteries are located where the soil is well-drained and easy to dig. It is preferable to establish cemeteries in existing local cemeteries or near churches. Where possible, they are concealed from hostile observation and protected from hostile artillery fire. FM 10-10, C1 dated 8 October 1942 > The Graves Registration Officer is detailed from available Officers of the Corps Quartermaster Service and serves as such under the general supervision of the Chief of the Administrative Division. He is charged with all Graves Registration and Mortuary matters pertaining to Corps troops. Personnel required for registration and other administrative work is provided by the Administrative Division. The labor required for burial duty is furnished from combat troops or from the Quartermaster Service Company, while the necessary transportation is detailed from the Truck Battalion. In situations where the administrative personnel of the Corps Quartermaster Service is inadequate to perform the registration and clerical work required, a Graves Registration unit may be attached by the Army, the size of which is determined by the requirements. In battle, a Graves Registration and Burial Detachment is stationed at the Clearing Station for Corps troops. Another Detachment operates from the Corps troops cemetery. Collections are made at unit Aid-Stations and from Burial Collecting Stations established during the search of the battlefield. One additional Service Company is required to handle the average burial requirements of Corps troops during battle where burial is performed by the Quartermaster Service unit. 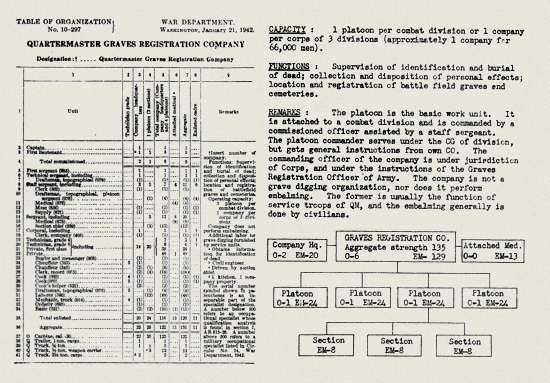 Chart illustrating Table of Organization 10-297, “Quartermaster Graves Registration Company”, dated 21 January 1942. In time of war a “Graves Registration Service” was organized for the purpose of caring for deceased military personnel interred outside the continental limits of the United States. Graves Registration Service personnel were further required to care for civilian, Allied, and enemy dead when circumstances of war made this necessary. As this kind of activities required GRS unit Officers to cooperate with Commanding Officers of combat units, the Medical Department, and Chaplains, we thought it opportune to include this non-medical organization in our medical website. It should be clear that Medical personnel attached to the Graves Registration units were not intended for use in treating the wounded or performing other functions of the Medical Department in the combat zone. Their main function was to assist GRS personnel in establishing cause and certainty of death, and in identifying the dead by means of technical inspection and notation. Their basic training indeed fitted them for a rapid and accurate execution of this task. They were very familiar with medical terminology and anatomical details, and therefore often served as technical contact men. Close coordination between Medical Department and Graves Registration personnel facilitated the separation of the dead from the wounded and the rapid burial of the former. As we pointed out earlier (please see above background information), The Quartermaster General, in addition to his other regular duty; was designated Chief, American Graves Registration Service (AGRS), and charged with formulating the general policy for the operation of subject services outside of the US. The Commanding General of each Theater of Operations or Defense Command (outside the continental United States) was requested to organize a GRS which functioned as a part of the Office of the Quartermaster of the Theater or Defense Command. He was to issue the necessary instructions for his Command, and was to conform to the instructions as indicated in FM 10-63 and in Section II, Army Regulations 30-1805. Estimates of Graves Registration Companies needed for continental operations dated back to February of 1943. The Office of the Chief Quartermaster estimated that 10 Companies would be enough for the Communications Zone and the Field Forces. Requirements were however recalculated in July when new Tables of Organizations were received in the ETO. After much discussion and meetings G-4, ETOUSA and the OCQM agreed in March 1944 that a total of twenty-one (21) Graves Registration Companies would be used during the continental operation (i.e. D-Day). Nine (9) were recommended for the Communications Zone and twelve (12) Companies would support the Field Forces. G-1, FUSA, published their own plans for the Invasion of the continent as an annex to their Operations Plan “NEPTUNE” entitled “Burial and Graves Registration Plan”, dated 27 February 1944 and “Graves Registration Plan for Continental Operations”, approved later. In an effort to meet emergency demands for critically needed QM Officer and Enlisted Specialist between 1943 and 1945, the Quartermaster School presented 3 specialized courses. A GR course was established in response to requests from Theater Commanders late in 1942 for Officers capable of handling casualties in combat zones, and another three 2-week classes for Officers were conducted during the first half of 1943. (except for the field ranges – typewriters – 2½-ton trucks, the other increases were approved by General D. D. Eisenhower 11 June 1944). 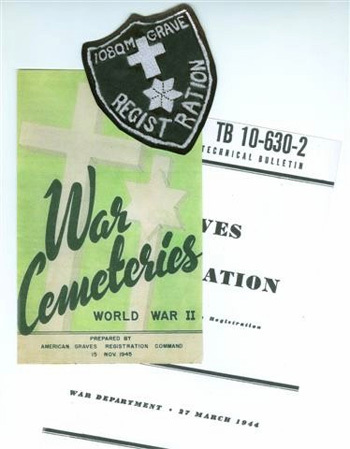 Cover of Handbook for “Emergency Battlefield Burials and Graves Registration by Troops”, published by Headquarters, Services of Supply, ETOUSA, OCQM, dated 1 December 1943. Note: Each Battalion, Regiment, Division, and higher headquarters, as well as hospitals, depots, and other separate installations, and where circumstances made such action desirable, Companies, Batteries, Troops, and other small separate units, appointed a Graves Registration Officer (from personnel other than members of the Corps of Chaplains) and provided manpower to perform the functions of the QM Graves Registration Company’s personnel in its absence (they were to furnish personnel to augment QM GR people for evacuation of the dead to the cemeteries; to provide men to supplement QM GR people in identifying the dead and digging graves; and to perform all GR activities in the absence of proper GR Company staff and enlisted personnel). On 11 October 1944, Headquarters, ETOUSA, US Army, APO 887, ref. AG 293 OpGD, published new Directives, signed by Brigadier General R. B. Lovett, Adjutant General, related to the Beautification and Maintenance of World War II Cemeteries, outlining responsibility – limitations – personnel – materials & supplies – and inspections. On 9 January 1945, Headquarters, ETOUSA, US Army, APO 887, published Change No. 3 of ETO-SOP No. 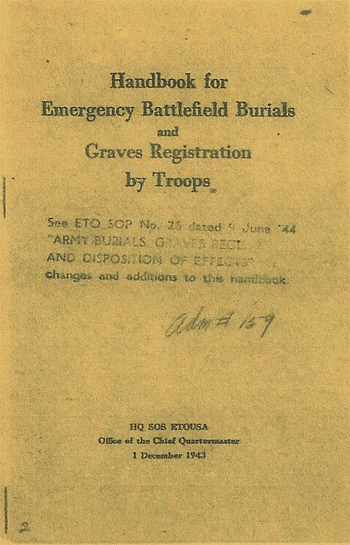 26, Burials and Effects, signed by Brigadier General R. B. Lovett, Adjutant General, detailing the amendments to Army Burials, Graves Registration, and Disposition of Effects. Temporary cemetery, somewhere in France. German PW labor details are busy digging and burying American war dead. The proper way was to envelop the remains in a white cotton mattress cover, used as a shroud or burial garment (MD Item No. 71620 or QMC Item No. 27-C-7500). If not available, other materials were used such as bedsheets, tablecloths, curtains, blankets, parachute canopies, discarded canvas, or tarpaulins. If the proper material was lacking, the dead were simply buried in their clothes. On 1 April 1945, Headquarters, ETOUSA, US Army, APO 997, ref. AG 293 OpQM, published additional Directives governing Burial of Military Personnel, signed by Brigadier R. B. Lovett, Adjutant General. On 1 July 1945, Headquarters, USFET, ref. GO 141* (AG 322 OpGC & AG 322.01 OpGC), signed by Lieutenant General W. B. Smith, Chief of Staff, announced the establishment of the Graves Registration Service Command, United States Forces, European Theater including the announcement of assignment of Brigadier General James W. Younger, US Army, as Commanding General of the new organization. On 19 September 1945, Headquarters, USFET, APO 757, ref. AG 210.3 GAP-AGP, released the following announcement signed by Brigadier General R. B. Lovett, Adjutant General: Since the US Theater Graves Registration Services will extend operations to all countries in Europe it is highly desirable therefore, that the services of Officers who wish to remain in Europe for a minimum period of one year and more preferably be secured. Officers in grades from Lieutenant to Colonel are needed, with military or civilian experience and training in a number of specialties. The latter included command and staff experience, architectural and engineering experience, unit supply, depot management, supply planning and organization, traffic management, motor – rail – water – air transportation, other skills such as administration, personnel management, fiscal accounting, procurement, investigation and identification work, and mortician’s experience. On 22 September 1945, Headquarters, USFET, ref. GO 259, Headquarters, USFET, signed by Lieutenant General W. B. Smith, Chief of Staff, announced that effective 1 October 1945, under the provisions of Section II, Circular No. 2, War Department, 1 January 1945, and Letter, File AG 322 (24 Jan 45), Ref. OB-I-SPOPP-M, The Adjutant General’s Office, War Department, dated 30 January 1945, the American Graves Registration Command, European Theater, was established, to function under the Chief Quartermaster, Theater Service Forces. It continued stating that Major General Robert M. Littlejohn, was assigned as Commanding General of the AGRC, European Theater, in addition to his duties as USFET Chief Quartermaster. Personnel, equipment, reports, records, correspondence and other property or material pertaining to or used in the GR Administration and operation in the European Theater were to be transferred to the AGRC not later than 15 November 1945. Member of a GR unit sorting personal effects of a deceased soldier. By the end of World War 2, several hundred temporary burial grounds had been established by the U.S. Army on battlefields around the world. In 1947, 14 sites in foreign countries were selected to become permanent burial sites by the Secretary of the Army and the American Battle Monuments Commission. These permanent sites were turned over to the ABMC after the interments had been made by the American Graves Registration Service in the configuration proposed by the cemetery architect and approved by the Commission. After the war, all temporary cemeteries were disestablished by the War Department and the remains were permanently interred in accordance with the directions of the next of kin. (in a few instances, the next of kin directed that isolated burials be left undisturbed; when doing so, the next of kin assumed complete responsibility for the care of the grave). After the war many families wanted their loved ones buried in the United States, so between 1947 and 1954 the Army’s American Graves Registration Service oversaw the repatriation of 172,000 American dead. QM Graves Registration-related items (top) locally-made hand-embroidered unofficial SSI of the 108th Quartermaster Graves Registration Platoon, Korean War era; (left) Leaflet “War Cemeteries World War II”, prepared by the AGRC, dated 15 November 1945 (courtesy Bob Molenbeek); (right) Technical Bulletin TB 10-630-2 “Graves Registration”, dated 27 March 1944 (courtesy Brian N. Siddall). It should be added that the distribution of GR Platoons was disrupted from time to time in order to attach an additional Platoon to an Army or a Division for searching operations. Moreover, Platoons were frequently rotated so that each could get experience in all types of Graves Registration work and activities. As of 30 April 1945, according to casualty reports, fatalities in battle totaled 174,656 for all Theaters, 108,731 having fallen in the European Theater, 36,274 in the Mediterranean Theater, and 29,651 in other Theaters. Non-battle deaths were estimated at 22,000. To these figures the 25,000 recorded burials of the Navy, Marine Corps, and Coast Guard personnel, together with the difference between deaths of these services and their recorded burials, should be added. With 44,243 military personnel reported as MIA on 30 April 1945 in the ETO, 22,121 remains could be added to the tentative aggregate of that date which then reads 243,777 (the latter figure does not include the remains of American dead interred in the Zone of Interior). In the MTO, 36,746 dead, i.e. 28,630 American, 659 Allied, and 7,457 enemy were interred in 51 different United States (temporary) Military Cemeteries or official registered burial places, 14 of which were located in Africa, 10 on islands in the Mediterranean Sea, 20 in Italy, and 7 in Yugoslavia. The largest single site was the U.S. Military Cemetery at Nettuno, Italy, containing 6,060 American, 61 Allied, and 2,604 enemy dead. In the ETO, 190,985 dead, consisting of 117,322 American, 1,773 Allied, and 71,890 enemy, were concentrated in temporary U.S. Military Cemeteries. Chart illustrating Table of Organization 10-67, “Quartermaster Service Company”, dated 29 October 1943. For more information about American WWII Military Cemeteries & Memorials in the ETO, please click here. By 1 December 1945, the number of unresolved casualties (presumed dead, missing, buried) totaled 27,780. Selection of a site for a temporary cemetery, although its acquisition and plotting would normally be performed by the Corps of Engineers. Location and control for preservation of temporary cemeteries, including the proper marking and official recording of all graves, until permanent burial could be accomplished, or remains could be returned to the next of kin. Proper burial of all dead in accordance with existing regulations, reducing the number of isolated or single graves to a minimum. Receipt, collection, and disposition of all personal effects found on the dead. Registration of all graves in order to enable proper identification of the dead and relocation of isolated graves, cemeteries, and graves within cemeteries. This included the preparation of sketches, maps, and data to show the location of graves and cemeteries, with particular reference to permanent landmarks. General supervision and control of all personnel assigned to the Graves Registration Service. Member of a GR unit examining body remains in order to help identify the deceased soldier. Chief, Graves Registration Service, Communications Zone (ComZ). Graves Registration Officers of Field Armies and higher units in the combat zone. Graves Registration Officers of units in the Communications Zone, not under command of ComZ. Graves Registration Officers of all combat and service units. Graves Registration Officers of depots, hospitals, airfields, and similar establishments. The basic functions of a Quartermaster Graves Registration Company in the ETO were mainly based on T/O & E 10-297, dated 6 November 1943. The organization was responsible for the supervision of the identification and the burial of the dead, the collection and disposition of the personal effects, the plotting of locations and the registration of battlefield graves and cemeteries. Labor for grave digging was normally provided from QM Service Companies or from other sources (such as PW labor details or hired civilian personnel) unless burial by organizations was dictated. The Tables of Organization and Equipment 10-297 provided for 6 Officers and 119 Enlisted Men, including attached Medical Detachment personnel. The Company itself was subdivided into Company Headquarters, consisting of 2 Officers and 19 EM, and 4 Platoons of 1 Officer and 22 EM each. The Platoon was the basic work unit designed to serve a specific Division. Each Platoon was further divided into 3 Sections with 6 EM to a Section. Detailed view of markings stamped on the White Cotton Mattress Cover (Item No. 71620). Control of the technical functions of the GR in the Army area, including the employment of Quartermaster Graves Registration Companies. Maintenance of the office of records for all GR matters pertaining to the Army. Establishment and operation of cemeteries in the Army area; and when required, the transfer of cemeteries to other commands. Control and evacuation of deceased personnel through the establishment of GR Collecting Points. 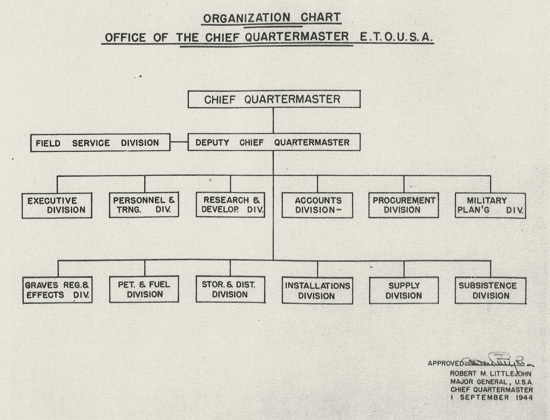 1 September 1944 Chart illustrating the “Office of the Chief Quartermaster”, ETOUSA, and its different Divisions. Above-mentioned Standard Operating Procedures listed the changes and additions to the “Handbook for Emergency Battlefield Burials and Graves Registration by Troops”, HQ, SOS, ETOUSA, OCQM, dated 8 October 1943, later superseded by “Handbook for Emergency Battlefield Burials and Graves Registration by Troops”, HQ, SOS, ETOUSA, OCQM, dated 1 December 1943. ETO-SOP No. 26 was once more amended with Change 3 (C3) published by the War Department on 9 January 1945. (though above T/O & E type was not entirely implemented in the European Theater, it was recommended for any future campaign. After the war, the General Board, USFET, however recommended that Graves Registration teams be organized under a new T/O 10-500 series and be made available to any Theater as needed. The latter provided a number of composite Battalions, Companies, or Platoons, from which the Theater Commander could select correctly-sized teams or combined teams, by grouping them under appropriate Headquarters, and organize them into composite organizations, or add or assign them to augment standard QM Companies when more extensive services were required than could be normally supplied. Available services classified under T/O & 10-500 included ‘miscellaneous’ units, such as Graves Registration – Fumigation and Bath – Salvage Collection – and Labor units). 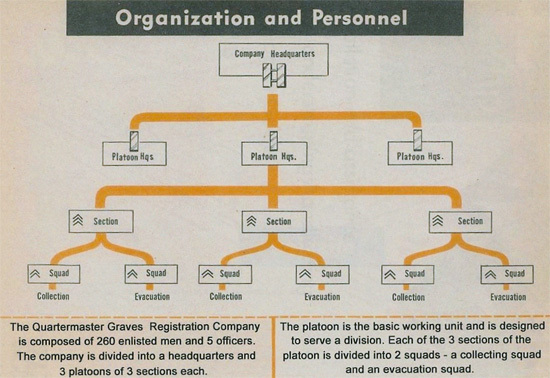 The Platoon was the basic subdivision of the Graves Registration Company and its basic work unit. It was designed to serve a Division, and came under direct control of the Division Quartermaster. The Platoon CO was a Commissioned Officer responsible for directing and supervising all activities, including burials and all matters pertaining thereto. The XO, a Noncommissioned Officer, in addition to his duties as an assistant Platoon Leader, was responsible for final inspection of identification and burial records, including forwarding records and data to Company Headquarters, furnishing the draftsman with ID data, and the Section leaders with information concerning the location of Collecting and Clearing Stations. The attached Medical Department NCOs were assigned to the Sections as directed by the Company CO. They made or assisted with the final and more technical phase of identification, and were ultimately responsible (with the Platoon NCO) for the final check of records before these were forwarded. The number of attached Med Det Noncommissioned Officers permitted the normal assignment of one to each Section (which was expected to be the usual assignment). It must be noted however, that casualties in certain areas, due to the character and extent of the action (such as Airborne fighting and resulting losses, after D-Day, 6 June 1944), necessitated a different distribution. The Platoon Commander, would then, under general instructions from the Company Commander, serve directly under the CG of the Division in the sector to which he was assigned. His immediate superior (for administration) then became the Division Quartermaster. His reports were however to be first transmitted to his Company CO, and further to Division. Belgian Ardennes, Winter 1944-45. 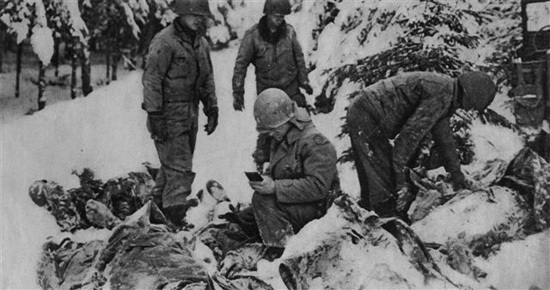 A Graves Registration Officer identifies American dead among enemy soldiers in the Battle of the Bulge. In March 1944 (England), the 603d QM Graves Registration Company was selected to support VII Army Corps during its D-Day operations, and each of the four Platoons was assigned to support one of the assaulting Divisions. First Platoon went to the 4th Infantry Division, Second Platoon to the 9th Infantry Division, Third platoon to the 90th Infantry Division, and Fourth Platoon to the 82d Airborne Division. The Section was an element of the Platoon, and consisted of a Section Chief and additional personnel (as authorized by T/O & E 10-298). All GR activities were to be well coordinated with the Platoon. One Med Det NCO worked with the Section and contributed to efficiently perform its function, consisting of collecting, identifying, and evacuating all battlefield dead. To accomplish its mission the Section was further divided into 2 different Squads (Collecting and Evacuation). The Collecting Squad was part of the GR Section, and was responsible for collecting battlefield dead, including both personal and issue items (which could help with identification). The Collecting Squad usually transported the bodies, via litter, to a central Collecting Station. Its personnel consisted of the Squad Leader, assisted by a number of laborers all trained in identification procedures. The Evacuation Squad was in charge of the Collecting Station and consisted of a Squad Leader, a number of laborers, and truck drivers. With the assistance of an attached Medical Technician, the Squad Leader initiated the identification process and supervised the loading of litters onto vehicles for evacuation of bodies and remains to the Division Graves Registration Clearing Stations. A clerk was then provided to assist in identification of bodies, segregation, listing and proper disposition of personal effects (via Company Headquarters) for shipment to Graves Registration Service Headquarters, Kansas City, Missouri, continental United States. Illustration of a temporary wooden Name Peg (FM 10-63 page 40). 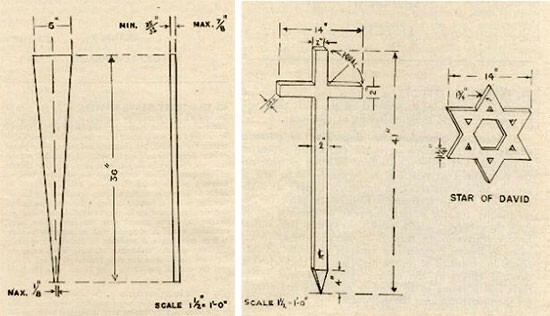 + Illustration of a temporary Greek Cross and Star of David, wooden items (FM 10-63 page 41). It was recommended that unburied dead be removed as rapidly as possible and buried. The removal was to be carried out in a most considerate manner and with the least confusion in order to sustain the troops’ morale. Bodies were to be covered, especially if mangled or in an unpresentable condition, when carried or transported to the cemetery or other place of interment. Routes were to be selected in order to avoid contact with troops as much as possible, and places of burial were to be screened from roads if feasible. The removal of the bodies and remains was to be accomplished with a reverent attitude toward the dead. If any wounded were to be found, their removal would be the task of the Medical Department and troops detailed for that purpose. 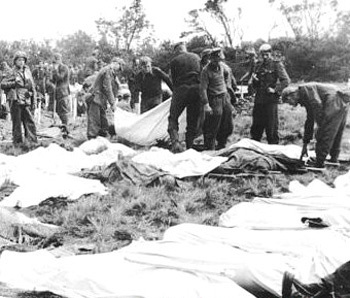 In all cases the bodies were to be wrapped in clothes, parachute material, sheets, blankets, mattress covers, or shelter-halves fastened securely with large horse-blanket safety pins (there were no body bags in WW2, and sheets and blankets being in short supply, white cotton mattress covers were normally used in lieu of body bags –ed) before burial, if possible. When interments were made by Company Commanders they were instructed, as soon as possible, to report all facts to the GR personnel operating in the sector, in order to maintain complete data and records of the burials. Normally, a Graves Registration representative was to be present to supervise the burials and the preparation of burial records. If not, a Chaplain, a Medical Administrative Officer, or some other Officer could be designated as a burial Officer. Whenever possible, it was recommended that a Chaplain of the Faith of the deceased should perform the burial rites. View of a number of Personal Effects Bag (QMC Stock No. 27-B-250) used to pack effects found on body remains in order to return them to the next of kin of the deceased soldier. When it was necessary for personnel other than GR to accomplish the burial, an NCO or well-qualified EM of the Medical Department was to accompany the burial party on the battlefield and prepare War Department, MD Form 52b (Emergency Medical Tag) for each body not previously so tagged! The final and complete systematic search for bodies was to be initiated as soon as the combat area was free from hostile fire. Careful searches were to be conducted of battlefields to ensure that burial of the dead and registration of graves had not been overlooked. When found, unburied dead were to be interred in the nearest established cemetery, and unmarked graves marked temporarily so that they could easily be relocated later, all this had to be reported to the GR Officer concerned, for immediate further action. In the search for bodies, great care was recommended to avoid booby-traps and antipersonnel mines which could have been placed under bodies by the enemy. The EMT attached to the bodies of the sick, the wounded, or those killed in action, including those prepared by Medical Department personnel accompanying the burial party, was to be removed at the time of interment, in order to be forwarded to the Chief Surgeon, who then transmitted it further to The Surgeon General. The wire (metal) or tie (cotton) was to be removed from the Tag before forwarding, while the carbon copies of the EMT were to be assembled and utilized by the senior Medical officer to compile the daily lists of casualties. One of the two Identification Tags (aka Dog Tags) worn as prescribed by Army Regulations around the neck, was to be attached to the remains when interred, while the duplicate Tag was to be removed at time of burial and securely attached to the Grave Marker about two inches from the top. A complete set of fingerprints (all 10 fingers) was to be made, and if possible, tooth charts, notations of anatomical characteristics, and results of body inspection, were to be properly carried out or noted. No remains were to be buried as Unknowns until every available means of identification had been exhausted. When personal Identification Tags were missing, identification was to be attempted by members of the same organization of the deceased; this was then to be recorded and a copy of same placed either in a canteen, a bottle (later Identification Burial Bottles), or other container and buried with the body. When bodies could not be identified immediately, uniformed methods and procedures for burial were to be followed. Unidentified bodies would then be appropriately marked Unknown Soldier, designated by block letter X, a dash, and a serial number. Illustration of “Graves Registration Form No. 1” (Revised 11 May 1943) used by GR personnel in the field. Procedures for collection, evacuation, and burial of enemy dead took place following same procedures, with the exception that information concerning enemy dead was to be handled through the Prisoner of War Information Bureau, and as prescribed by the Geneva Convention. Enemy dead were then buried in a separate section of the cemetery apart from regular burial sites of members of the own or Allied Armies within the cemetery (separate American and German cemeteries would be established later –ed). Such graves were to be properly marked and registered and remained in the custody and care of the Quartermaster Corps. A metal Tag marked “ED” was to be prepared and attached to the temporary grave marker. A Report of Interment was to be made and forwarded through Army channels; the original to The Quartermaster General; a copy to the Central Records Office (Casualty Section), the Adjudant General’s Department, the Theater of Operations or Base Command; another copy to the Chief Surgeon (field forces); and a final copy to Reports of Enemy Dead, Prisoner of War Information Bureau, Central Records Office, Provost Marshal General’s Office (in case of enemy dead). Weekly Reports showing the number of burials made in a particular section, at the end of each week were to be prepared for further submission. Deserters, Dishonorably Discharged men and General Prisoners were to be buried in a separate section designated for this purpose. Reports of Allied dead (non-American) buried by the GRS were to be copied and forwarded to the appropriate Allied Government authorities. Notes: When laying out cemeteries the standard plan furnished by The Quartermaster General was used only as a guide. Departures from the plan were generally made to conform to physical terrain features, roads, property boundaries, and local conditions. Anyway, cemeteries were to be well screened from hostile ground observation and located beyond the range of enemy artillery; nevertheless, they were to be located in places convenient to sectors where the heaviest fighting and casualties were to be expected. It was recommended to avoid establishing cemeteries near a location or bivouac of combat troops or reinforcements, or alongside roads frequently traveled by troops. Third and Ninth United States Armies conformed to the 300-grave plot plan, First United States Army used a 200-grave plot plan, while Seventh United States Army preferred the 144-grave plot plan. In practice, the 200, 300, and 1200-grave plot plans were found to be too large. In the US Army cemeteries separate plots were designated for: all individuals subject to military law, such as US Army, US Navy, US Marine Corps, US Coast Guard, American Red Cross, accredited War Correspondents and Technical Observers – Allied dead – enemy dead – deceased deserters and general prisoners. In the ETO, Graves Registration supplies were considered expendable items. Since bedsheets and blankets were both in short supply, white cotton Mattress Covers were normally used as shrouds. The Beach Maintenance Sets for “Operation Neptune” (D-Day, 6 June 1944) included a single Mattress Cover for 375 man-days, and follow-up sets decreased this allowance to 1 (one) for 450 man-days. At the end of July 44, the supply in Normandy had been depleted, and QMC rear Headquarters in London were instructed to ship 50,000 Mattress Covers to the Theater immediately – even by air, if necessary! During the next several months, Graves Registration supplies were requisitioned by daily telegram as were other Class II Supplies, with the same unfortunate results. After this procedure was amended, course of December 1944, 20-day credits for Graves Registration Supplies would be established for each Army and Base Section. Emergency requisitions of supplies actually used in processing the dead, such as Mattress Covers, Wooden Crosses and Personal Effects Bags were further always honored, regardless of credits. It was however sometimes necessary to edit separate requisitions for distinctive equipment of Graves Registration Companies, such as Rubber Gloves and Stripping Knives. View of box containing 6 Identification Burial Bottles, green glass recipients with white cap (QMC Stock No. 57-B-1000). 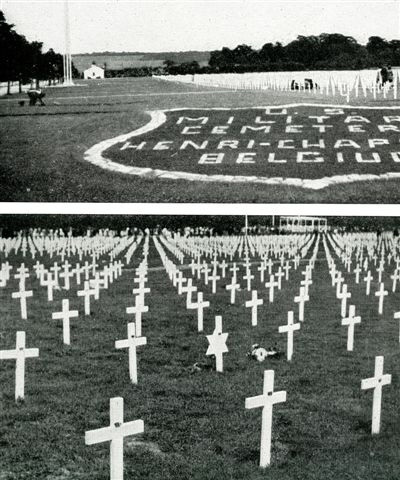 Temporary Grave Markers – name pegs, temporary grave markers, labels, were obtained from the local Graves Registration Service units, but Chaplains and Officers were expected to keep themselves supplied by means of prescribed requisitions on the GRS of the Theater of Operations, including such special items as rubber gloves and stripping knives. The Quartermaster Corps was called upon to supply such elements as flagpoles, fencing materials, garden tools, wood, grass seed, and shrubs, normally procurable in the Theater, so in order to save precious shipping capacity and reduce delivery times, these elements were mostly obtained locally. Name Pegs were V-shaped wooden boards, 1-inch thick, 6-inches wide at the top, and 38-inches long. In the absence of name pegs, ordinary stakes could be used. In all cases, the duplicate Identification Tag was to be securely fixed to the peg (the original Tag having been buried with the body). In the larger cemeteries in which isolated burials had been concentrated awaiting return of bodies to the homeland, the graves could be marked with temporary Crosses and Stars of David (the Identification Tag that was attached to the temporary Name Peg, was then removed and fixed to this new Cross or Star of David Marker). Personal Effects – all effects found on remains by the burial party were to be regarded as personal effects; they were to be disposed of and listed on the Report of Interment. The proper handling and channeling of personal effects by the responsible GRS Officers was meant to reduce theft and pilfering to an absolute minimum and provide for a proper check on their shipment. An inventory list was placed in the Effects Bag (or other container) together with the articles of personal effects of the deceased. Copies were to be distributed, and forwarded to Effects Quartermaster, Kansas City Quartermaster Depot, Kansas City, Missouri. It must be noted that all Government issue property, other than clothing necessary for burial, was effectively withdrawn from the personnel effects and immediately delivered to the Summary Court Officer. Personnel in charge of burial parties were instructed to cooperate with Salvage units to the extent of collecting all equipment of issue of the dead and turning them in for salvage. The necessary Personal Effects Bags, Safety Pins, Embossing Machines, were to be requisitioned from the Office of The Quartermaster General. In order to conserve cargo space for the war effort, shipment of caskets and other mortuary supplies from the United States to overseas Stations and Base Commands was discontinued! Basic Organization Chart of the Quartermaster Graves Registration Company in the ETO, as based on T/O & E 10-298, dated 26 September 1944. Notes: It should be noted that Change 2, T/O & E 10-297, led to a complete review and allocation of individual and organizational equipment which was increased and improved to accommodate the additional personnel. This was reflected in the lists of individual items, unit equipment and vehicles. Subject document now authorized the Automatic Pistol cal. 45 for each Officer and Enlisted Man (except of course attached medical personnel) in the GR Company. As tentage was required to shield the processing area and morgue from public observation, experience in the ETO demonstrated that latrine screens (the available 6 were later increased to 12) were perfectly suited for this purpose. 8 additional standard typewriters were requested in order to replace the 4 portable machines which were found to be unsatisfactory for the amount of administrative work. 24 stripping knives were needed fore removal of effects. A small surgical or mortician’s kit, consisting of spatulas, syringes, knives, scissors, needles, and probing instruments, was further requested. A camera for making portraits of the deceased was thought to be desirable, as the usual Signal Corps photographers often could not be secured for days, and rapid decomposition of the bodies in warm weather did not allow for decent photographs. An earth auger for sinking test holes when selecting new sites for cemeteries was also welcome. 1 dental mirror for preparing tooth charts was recommended per Platoon; 12 pairs of quality rubber gloves for removing personal effects were needed to replace the surgical gloves, electrician’s gloves, or other standard gloves, which were not satisfactory for the mission; 12 pairs of electrician’s rubber gloves were recommended for personnel engaged in loading and unloading bodies; 6 pairs of additional surgical gloves were required to help the morticians operating in the morgue. In the end, it was thought that a small generator would help provide power to properly light both the morgue and office, instead of gasoline lanterns which did not produce sufficient light. 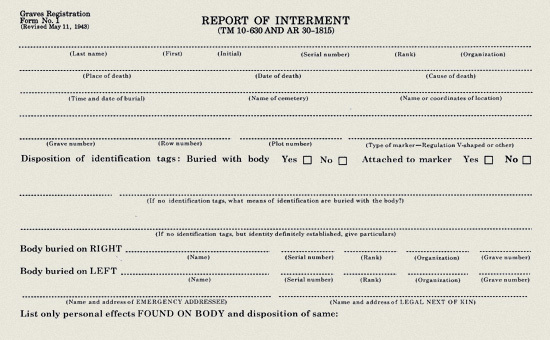 Report of Interment – Graves Registration Form No. 1, was to be prepared and forwarded in several copies through Army channels. It mentioned the place of burial, the name of the cemetery, the exact geographical location (but not the APO number), and the name of the Chaplain (or other Officer) conducting the burial rites. Weekly Report of Burials Recorded – Graves Registration Form No. 2, was to be filled out and sent through channels, at the end of each week. Personal Effects Bag – a standard bag, Stock No. 27-B-250, issued for Personal Effects of the deceased, closed by a knotted drawstring and a clamped lead seal, was to include an inventory list i.e. WD AGO Form 54 (made out in quadruplicate). Personal Effects Pouch – a registered shipping container for Personal Effects Bag, securely locked and sealed with a hasp locking strap, a padlock, and a lead seal (identical to standard Canvas Mail Bag) was to be accompanied by a Dispatch Card, sent from the originator to the Effects Quartermaster, Army Effects Bureau, Kansas City Quartermaster Depot, 601 Hardesty Avenue, Kansas City, Missouri. 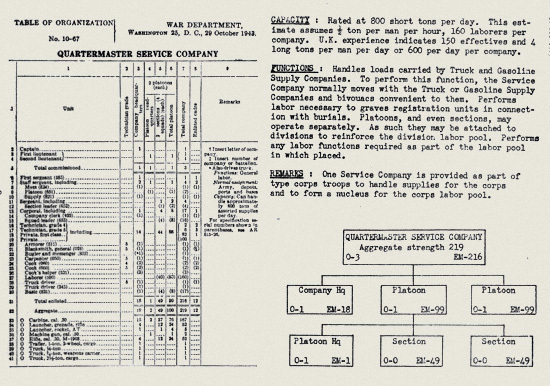 Illustration of “War Department Quartermaster Corps Form 1045”, 1 September 1944 (GRS No. 2) weekly report of recorded burials to be submitted to Headquarters. Pouch List – a list compiled by the originator of the shipment, containing name and organization of the deceased, was to be included in each Personal Effects Pouch, and subsequently signed by every Officer receiving it and opening it to check its contents, while in transit to Kansas City. Dispatch Card – a card contained in the transparent pocket of the Personal Effects Pouch, showing the signature of, the time of dispatch by, the originating Officer, and in the case of each intermediate Officer, date and time of receipt and date and time of dispatch, and signatures as well as any discrepancies noted. Identification Burial Bottle – a cardboard box containing 6 glass burial bottles, Stock No. 57-B-1000, expendable containers received written identification marks of the deceased, such as dental works, tattoos, and other necessary notations, one bottle was to contain above data and a copy of GR Form No. 1 and was to be appropriately placed in the left armpit and buried with the body, while a second bottle containing identical information was to be placed at the head of the grave, until a grave marker could be erected. (during the War in Korea, 30 QM Graves Registration Companies and 11 separate QM GR Platoons operated in the Korean Peninsula. Similar units later operated in Southeast Asia during the Vietnam War –ed). The MRC Staff are still looking for additional data and information relating to the activation, overseas deployment, and operations involving Quartermaster Graves Registration units in World War 2. Special thanks go to Brian N. Siddal, World War Two Research Analyst, who provided them with some very useful documents.All information always greatly appreciated. This page was printed from the WW2 US Medical Research Centre on 26th April 2019 at 02:46.